My bed is in between double and single. The fight I just had putting a single bed electric blanket on my bed. This is just a test run. See if it is OK. If not I will then buy a bigger one. This single one just happened to be in the house and not in use. My old electric blanket just gave up the ghost. More just trying to save a bit of money. Even the switch for it is in an odd place. With a bigger one it would be in a better place. Thinking the old one must have been a double one. How to get a work out without leaving your room. As my Mother stood there laughing. Not helping. Laughing. Sweat was dripping out of me. Lot of bed moving and the likes. Strings that go under the mattress and have to be tied off. Not good for the body. I am betting the weather will start getting warmer now. Always the bleeden way. The end of winter at last! so excited for what might be in store for the year! 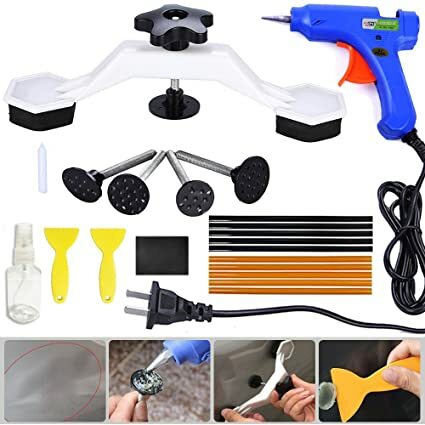 Tried using this to remove a dent on my hood after seeing a video that made it look easy and effective. I probably pulled glue at least a couple dozen times and maybe it got a little better. But the dent is still visible. Drat. Thought I could save $100.